This figure of a Kwagiulth Mugamt dancer was sculpted by Jack Gibson after personally observing a traditional Potlatch -- a very rare experience -- and studying the form of the dancer and his remarkable bird mask. These dramatic masks demonstrate some of the most unique and imaginative examples of art producted by the Kwagiulth. 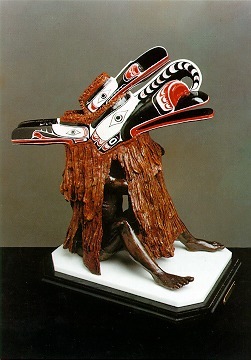 The mask truly depicts the traditional Kwagiulth multiple bird mask which was worn by high-ranking dancers, and represented the birdmonster spirits in rare traditional dances performed in the dramatic fireside ceremonies of the southern Kwakiutl. The huge jaws of the hand-carved, wooden beak were hinged, and with great strength, skill and co-ordination the dancer, by operating concealed strings, could make it utter a loud cracking noise as he leapt in a spirit-induced frenzy, swaying to the sounds of rattles and drums. This sculpture presents an unprecedented look into the culture and customs of the Kwagiulth people of British Columbia.